Huawei's MediaPad is a 7 inch tablet that can catch anyone’s attention immediately, made of uniform metal construction, excellent fit and build quality it is a great tablet to all surfing and watching movies. At its back there is situated an adjustable removable triangular panel which hides SIM and microsSD card. The screen display of Huawei Media Pad tablet has a resolution of 1289x 800 pixels. The tablet runs on Andorid 3.2 OS on a dual core 1.2 Ghz processor with 1 GB RAM with 8GB storage expandable microSD card. In the device Android 3.2 is fitted appropriately accordingly due to its proven capacity for the smaller devices. On performance it is suitable for navigation, running apps, multimedia and gaming. It is quite excellent for the multimedia playback, its MediaPad is fantastic. The tablet supports the most common and popular video formats and plays HD movies without a pause. Its sound is too loud because of dual speakers. Both the speakers are located at the same side of the tablet. At its backside there is located a 5mega pixel autofocus camera that enjoys an average quality images in daylight. Video recording can also be carried out in this in 720p HD resolution by both front and rear cameras but they make excessive noise. Along with wi-fi connectivity and mixed use of apps and multimedia, the MediaPad can easily ensure a 5 hour battery backup. 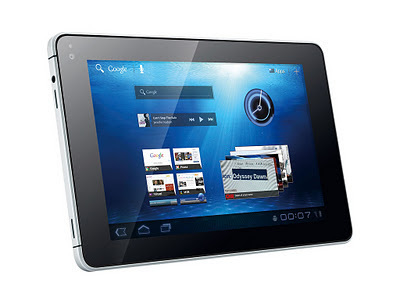 At present, the MediaPad is the only 7-inch Wi-Fi + 3G tablet running Android 3.2 tablet in India. It comes on an easy price range of Rs 22,000.